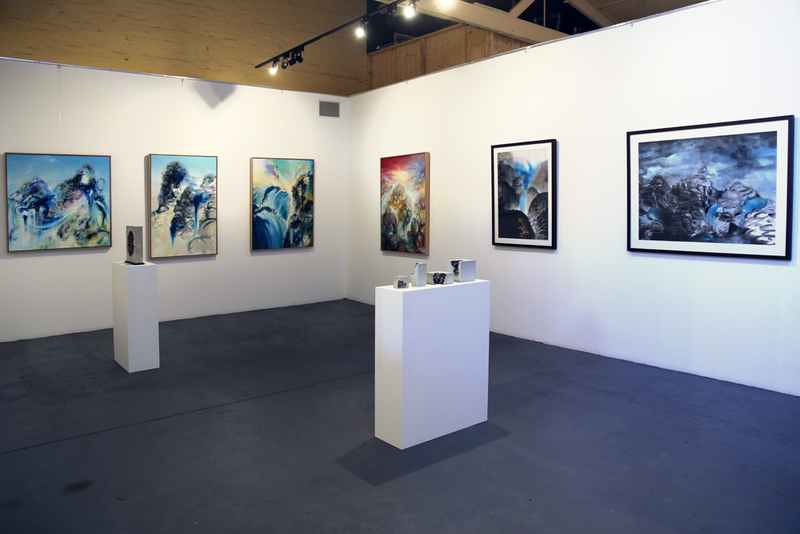 1st January - 31st December, artist year review, Melbourne. A huge thank you to everyone for their support, coming to my shows, voting for me in awards and buying my art. If it wasn’t for you I wouldn’t be able to do what I love. Wishing everyone a very happy new year. Here’s to lots of exciting projects for 2019…. 3rd November - 11th November, From Nature sculpture exhibition 2018. Gasworks Art Park, Melbourne. Connections not only speaks to the importance of our trees and the significant role they play in our lives, but also to the hidden and woven complexity of all life on this planet. We all too often dismiss and take for granted our natural world, but like the trees and the plants we too are connected to the earth in our own way. We need our trees and we need our connections. Possum Box - Myself and several other artists were asked by the artist Ted Powell to create our own bespoke possum box for his ‘Possum Hotel’ art project, which aims to protect and house native wildlife here in Australia. 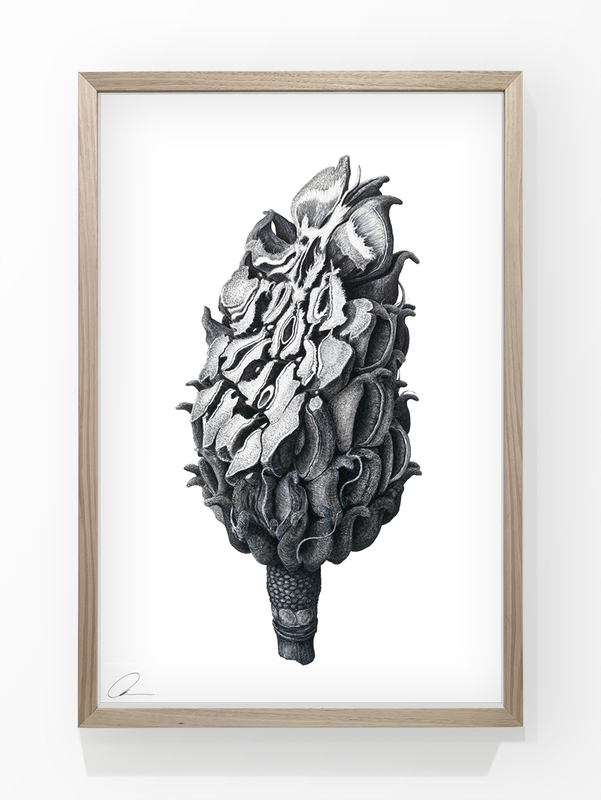 This piece is called ‘The Eucalyptus suit’ and reveals the hidden patterns and voids within the eucalyptus seed pods. 18th October - 22nd October, Albert Park Art Show 2018. Albert Park College, Melbourne. Like the great structures of worship, the design and forms of which celebrate the mathematical and geometrical harmony within nature, my drawing practice delves into the magnificent fractal order and intelligence present within all life. By revealing aspects of natural forms that are normally hidden my work invites the viewer to engage in a deeper contemplation of the natural world, and see that no matter what is removed there will always be another layer of truth waiting to be revealed. ‘From a Curator - Saatchi Art’- Victoria Kennedy, curator at Saatchi Art. 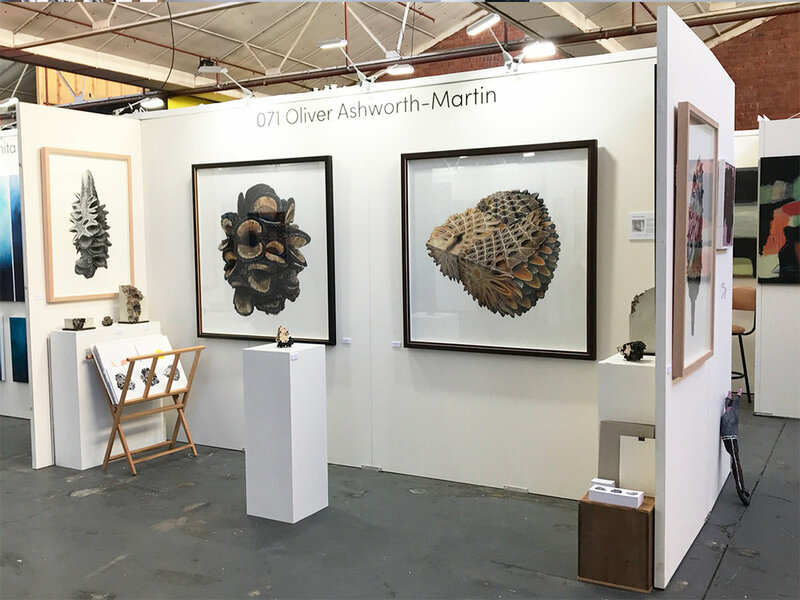 "Though there were many varying practices and styles of art at the fair, Oliver Ashworth-Martin's work left an impression on me. The incredible realism mixed with surrealism in Ashworth-Martin's works is what originally caught my eye. Originally from the UK, Oliver’s practice shifted when he moved to Australia and began to focus on the delicate wildlife that is constantly threatened by brushfires and a changing ecosystem. His work delights in the mundane objects of nature, such as seedpods, where he re-imagines and plays with their natural beauty. Although he has grasped realism in paintings and drawings, his practice also encompasses sculptural works. Ashworth-Martin has recently garnered multiple awards for his drawings and sculptures, and shows a promising future for such a young artist." Victoria Kennedy, Saatchi Art online blog 2018. The Paul Guest Prize is a non-acquisitive cash prize of $15,000 which is held biennially, highlighting contemporary drawing practice in Australia. The Prize was initiated by former Family Court Judge and Olympic rower, the Honourable Paul Guest QC and encourages artists from across Australia to engage with the important medium of drawing in contemporary art practice. 13th April - 13th May, Sculpture at Scenic World 2018, Blue Mountains, Sydney, Australia. Lost Fossil symbolises the ancient and powerful resilience of the Blue Mountains. Within these vast forests are home to extremely old species of global significance. This piece is an expression and celebration of those complex forms that we find replicated throughout nature and across time. While its cocoon and flower-like form is familiar to us, Lost Fossil also holds a deep mystery to its origins. It could indeed be a lost ‘living fossil’ that has remained hidden since the mountains formed millions of years ago. This organic sculpture speaks of a time long gone, to those magical and mystical forms of ancient flora and fauna. Its charred outer shell furthers our curiosity of its current state. Has its form been permanently fossilised or is it about to open up and reveal new secrets to the forest? 7th March - 28th March, Untitled 2018, Traffic Jam Galleries, Sydney, Australia. 4th Nov - 12th Nov, From Nature 2017, Gasworks Art Park, Melbourne, Australia. From Womb to Tomb explores the cyclical flow and transience of nature. 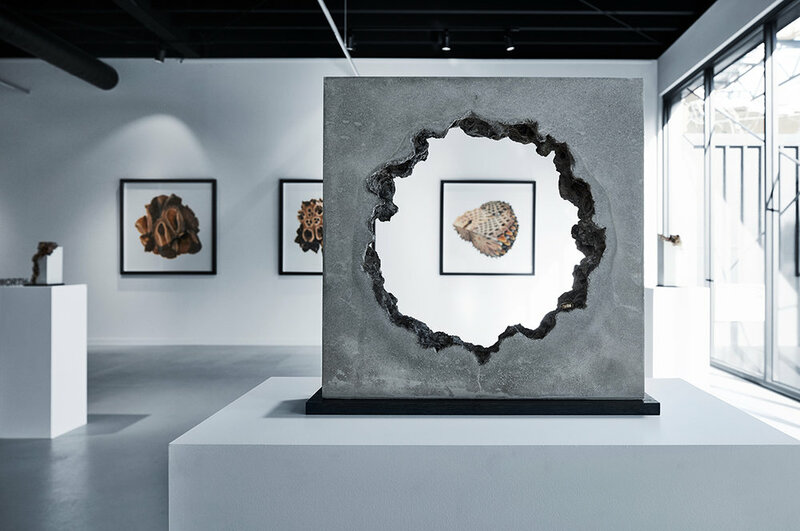 The piece is an expression of the lands power to destroy, such as the devastation caused by forest fires, but at the same time it provides regeneration and gives new life. This organic sculpture emerges from the earth with a volcanic and dramatic presence, as if something powerful had happened to it, but its form now lays dormant with new life emerging from its core. This sculpture is made from the fallen seed pod cases from the Queen Palm tree, which I have found and collected from the local area, along with pods that have kindly been donated by the Royal Botanical Gardens here in Melbourne. 25th Oct - 12th Nov, Bonanza 2017 - Winner of the Contemporary Sculptors Association Award 2017, YSG, Melbourne, Australia. Awarded art work 'Cycles' 2017. Cycles is part of a series of sculptures that I have created by setting the native seed pods into concrete and then burning the material away. What is left are the fossilised fingerprints of the forms, with the natural resin and carbon leaving stained echoes of the pod’s colour and texture. As nature herself holds the power to violently sculpt our landscape, I too wish to utilise fire as a tool in my sculptural practice. These sculptures are a subversion on the Eastern ‘Scholars Stones’ (Gongshi China and Suiseki Japan). These revered natural forms take millennia to shape, only after the elements and time have left their mark can these objects hold the spirit of the landscape and become ‘spirit stones’. By instantly removing the natural forms that have existed for millions of years I am leaving their ghostly impressions within an industrial man-made material. Nothing Lost seeks to transcend the everyday/mundane natural objects that we find scattering the land, and to re-awaken a fascination with our landscape. When we become aware and mindful of the environment we see that “what has always seemed so natural reveals how wondrously supernatural it is” (Frederick Franck, The Zen of Seeing). Through a process of removal, and clear human intervention upon the pods, Ashworth-Martin is attempting to show the unfathomable complexity and depth of the natural world, while simultaneously pointing to man’s impact upon it. Nothing Lost is an acknowledgement of the formless intelligence within the form, the ghost in the machine. For UK artist Oliver Ashworth-Martin, the Australian landscape’s vastness and abundance of life evokes a sublime connection with nature, and so Musings of a journeyman is as much a personal exploration of a uniquely Australian expression of the sublime as it is a communion with nature through objects found scattered across the landscape. In Ashworth-Martin’s works, native seeds and pods express nature’s unfathomable complexity and her cycles of renewal. Represented in isolation and transcending their natural scale , these inspiring forms exist autonomously, and yet their individuality still bears the traces of their connection to a greater whole: to the tree, to the forest, to the sky and to the void . As such these life -bearing vessels act as doorways that open into nature’s unknown and unknowable depths. This ancient land is scattered with the incredible forms of native seeds and pods. They have been the source in Ashworth-Martin's work to express nature’s evolving cycle from the formless to form and back again. These objects that act as vessels for life become symbolic doorways into the unknown and unknowable depth of nature. Ashworth-Martin has been particularly inspired by those forms in the landscape that seem to transcend scale. They seem to exist autonomously, like a pebble on a beach: its form still bears the traces of its connection to a greater whole, to the tree, to the forest, to the sky and to the great void beyond. These pieces, like much of his work, represent Ashworth-Martin’s own profound experience of the landscape during daily solar cycles, particularly when the light is at its transitionary stage. 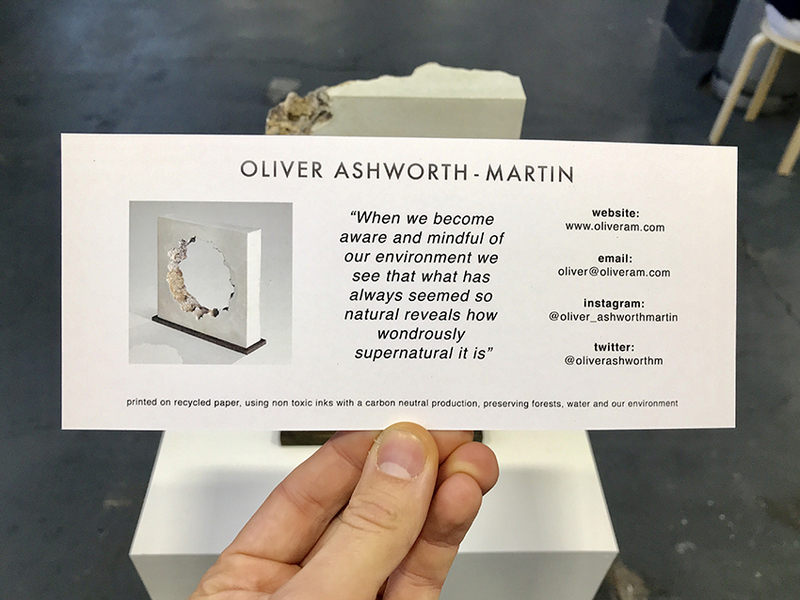 Oliver Ashworth-Martin’s practice as an artist is an attempt to get back to a communion with nature, back to a knowledge and respect for our environment that our ancestors knew and that we have forgotten. Only through a deeper communication with our surroundings can we find our way back to our true being, one that sees us part of an ever changing landscape of the form and the formless.